Since they opened in Boston in 2011, I've been hearing good things about Del Frisco's Double Eagle Steak House. It's part of the ambitiously redeveloped Liberty Wharf complex along Boston's waterfront in the Seaport District that includes the impressive Legal Harborside, Jerry Remy's, Temezcal Tequila Cantina and the newly opened 75 at Liberty Wharf (same folks as 75 Chestnut in Beacon Hill). Boston's steakhouse scene has really exploded in the past 10 to 15 years. It used to be just a handful of local joints like Grill 23 and Abe & Louie's but national chains have invaded with some compelling offerings. Current locations include Boston, Dallas, Charlotte, Denver, Fort Worth, Houston, Las Vegas, New York, and Philadelphia. Chicago coming soon. They're part of the Del Frisco's Restaurant Group with also includes Sullivan's and Del Frisco's Grille (which is coming soon to Chestnut Hill, MA I hear). Valet parking is $16. Metered street parking that needs to be fed until 8:00 pm is also available. You enter on the first floor to a lobby sort of area and are greeted by a hostess who directs you upstairs. 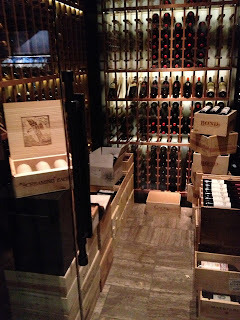 Immediately you'll notice a jaw dropping display of wines behind glass. 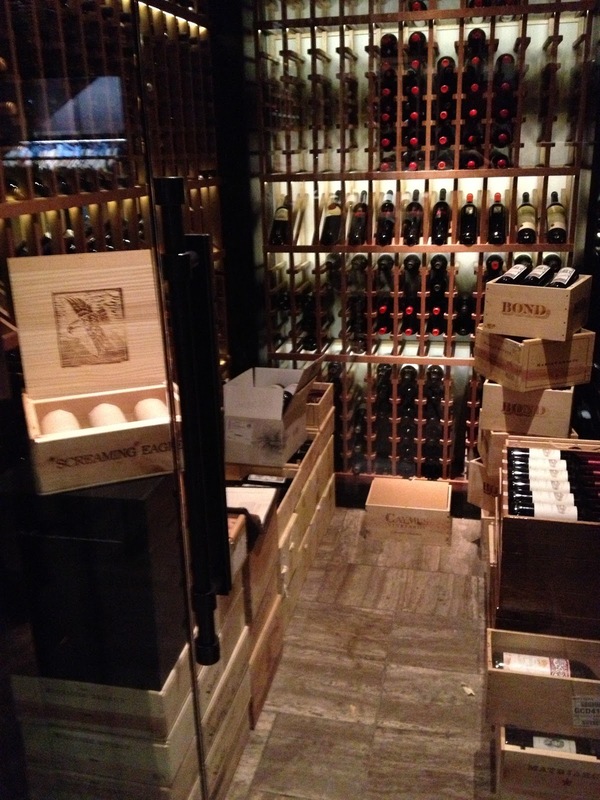 It looks like the Fort Knox of wine. Definitely worth a peak on your way out. The theme of the building around glass enclosed wine conveys on the second floor. Behind the hostess stand is a polished, sophisticated bar area with a nice combination of a large bar and low slung seating areas for 3 or 4. A circular outcropping overlooks the harbor. I've wondered how easy it would be to grab a seat at the bar for dinner on a Friday or Saturday night. From the looks of it on our way out at 8:30: Not easy. The few open spots I saw were marked "Reserved". We were a few minutes late so we were immediately directed to our table in the center of the dining room on the window with sweeping views of the harbor. It would be even more impressive on a clear night (it was rainy with low clouds the night we visited). Outdoor seating is perched outside the main dining room for warmer months and would be amazing on a late summer evening. 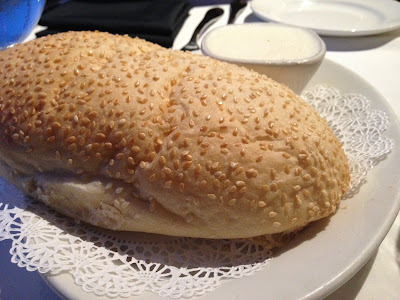 We were immediately greeted by our server Adam and, since it was our first time visiting and we asked, a quick overview of Del Frisco's (the Double Eagle refers to a signature double-thick cut of sirloin) and pointers for navigating the experience. Their leather-bound wine book drawfs the main menu which is printed on glossy cardstock. 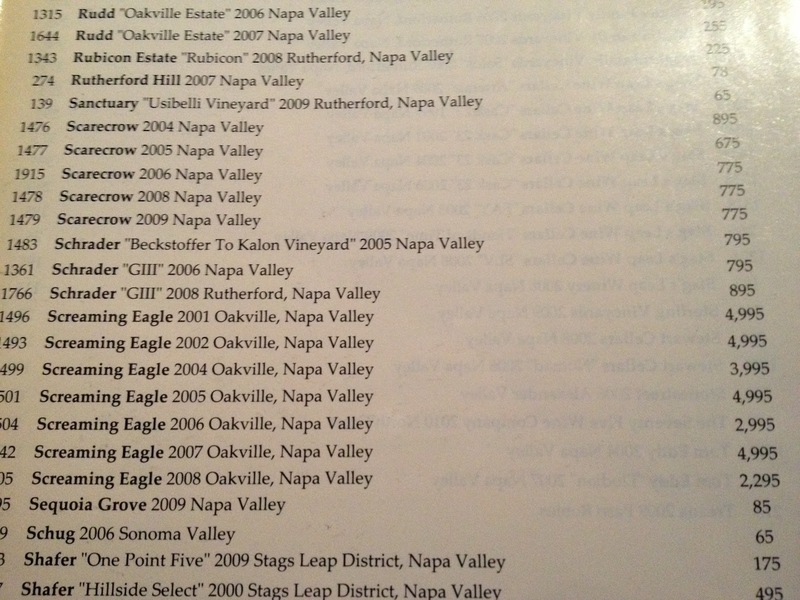 First a few benchmark Napa Cabs to orient myself with the average markup. 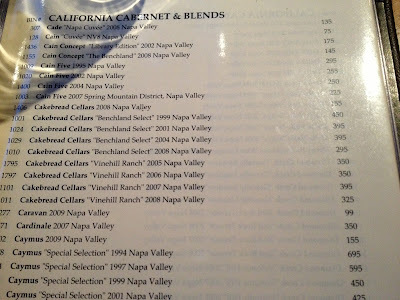 Click to enlarge, but the current releases from Cakebread and Caymus are $155. With a street retail price of $59 that's a markup of about 2.5x. Typical for a steakhouse. Looking for something a little more special? They've got you covered. Schrader, Scarecrow and Screaming Eagle are ready to go from $795 to $4,995. $1,250 for a glass of wine? I don't think I want to come to terms with that in my lifetime. 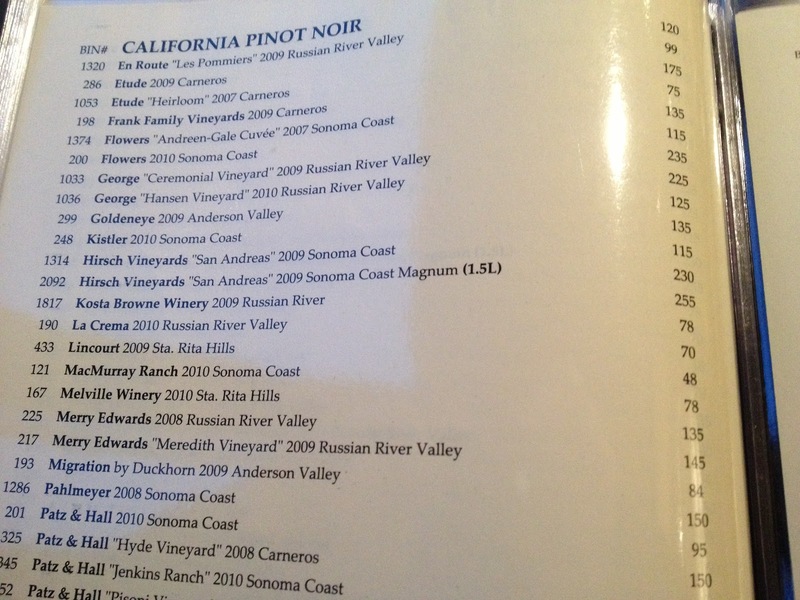 The California Pinot section was "okay" I'd say. At $72 for the benchmark Belle Glos Meiomi that's a scorching 4.2x markup over street price. 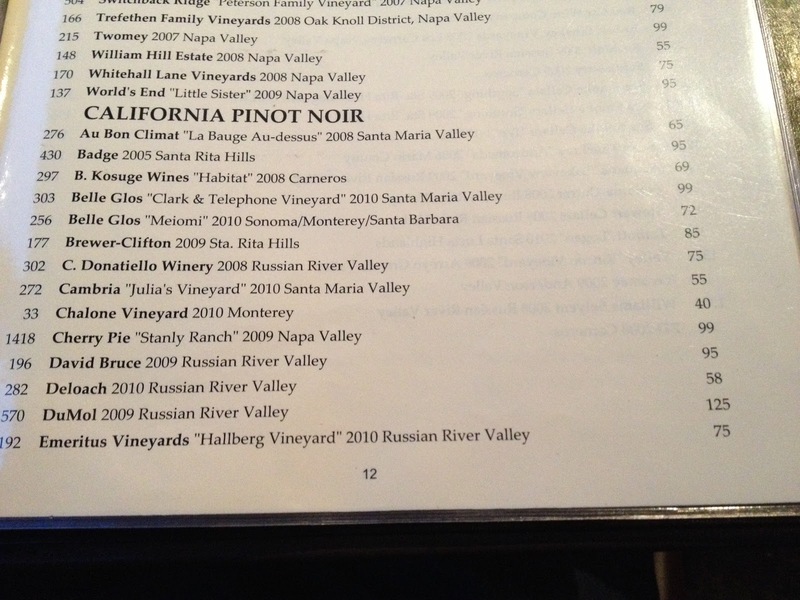 Some nicer California Pinot Noir options existed as well, but overall markups were insane and I felt they could have gotten a bit more adventurous with producers. 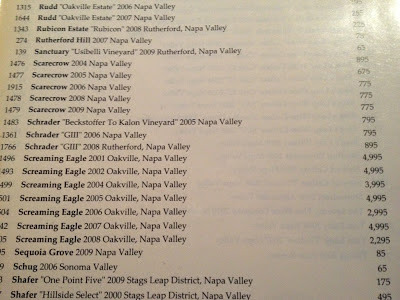 I was tempted by a few half bottles - 2009 Ridge Lytton Springs at $50 seemed fair, and 2009 Patz & Hall Sonoma Coast Pinot for $56. 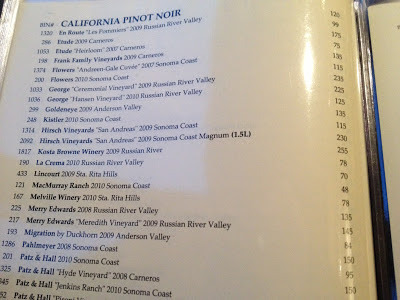 But wanting to try a couple different things I went by the glass. 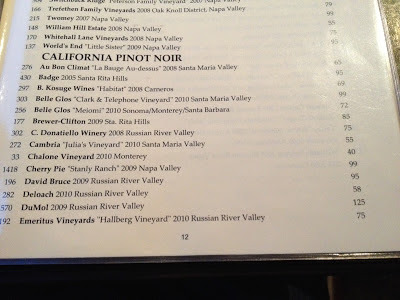 I went for a 2009 Hitching Post Pinot Noir for $16/glass which turned out to be, I thought, a very good wine and a nice start to the evening with the first couple courses. What I like about some of my favorite restaurants is that every aspect of the meal is something I enjoy. When it comes to steakhouses, it's not just about the steak. I like it when the appetizers, the sides, the desserts -- everything -- are something to look forward to. The bread they started us off with looked a little plain (I'd like to see more variety offered) but it was tasty. Slightly sweet. Wanting to compare Del Frisco's to some of our classic favorites we split a wedge salad. A very nice rendition! 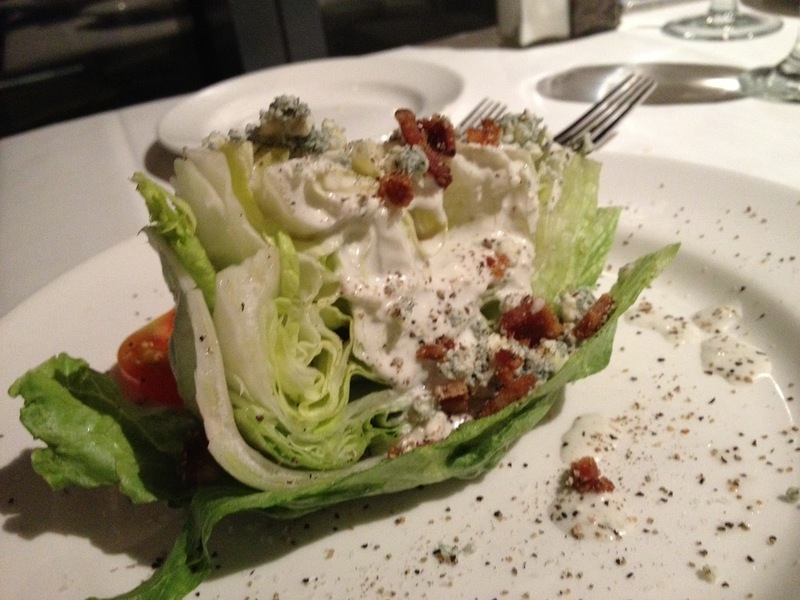 Not as smothered with bleu cheese dressing as some, it impressed me with its cold crisp lettuce and was particularly well seasoned. Adam recommended the crab cake and I'm glad he did. It was probably the single most impressive thing we tasted. Baked, not fried, it was again brilliantly seasoned with a little heat and a little sweetness I enjoyed. Spectacular. Prime Ribeye 16 oz. for $46. The prices seem to be setting the pace for Boston Steakhouses, and I'd say are on par with some of the best steakhouses in the country. I went for one of the special steaks not on the menu. Three 4 oz. 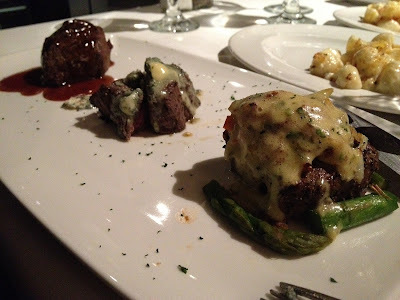 cuts prepared three ways: A red wine demi glace, bleu cheese, and oscar style (asparagus, crab cake, bernaise). I was interested in exploring their flavors more than just digging into a massive steak. They were well prepared and enjoyable for sure. I thought the bleu cheese treatment was a little too salty. It really clobbered the Lobster Mac & Cheese we ordered as a side (the pasta was a little overdone to boot). The red wine demi glace was pretty good. The oscar treatment was probably my favorite. The smaller cuts were interesting but I think I'd go for a more straightforward steak next time. I just don't know which one I'd get. 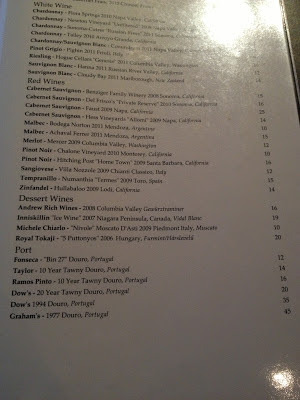 I had a glass of their house Del Friscos Cabernet Sauvignon. It was said to be made by Robert Foley and the style is what you'd expect: Generously fruit forward and delicious. I thought it went really nicely with the steaks and was good on its own too. For dessert we went with their highly touted Lemon Cake. 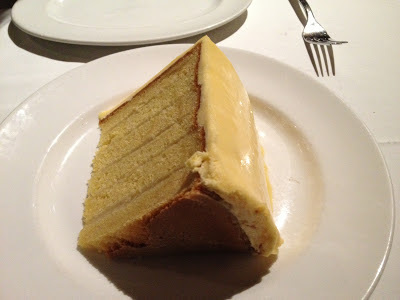 A massive slice of cake with a delicious lemon butter cream icing, it got to be a bit monotonous for my taste even when split. I thought the food was "very good" and several items were "outstanding". 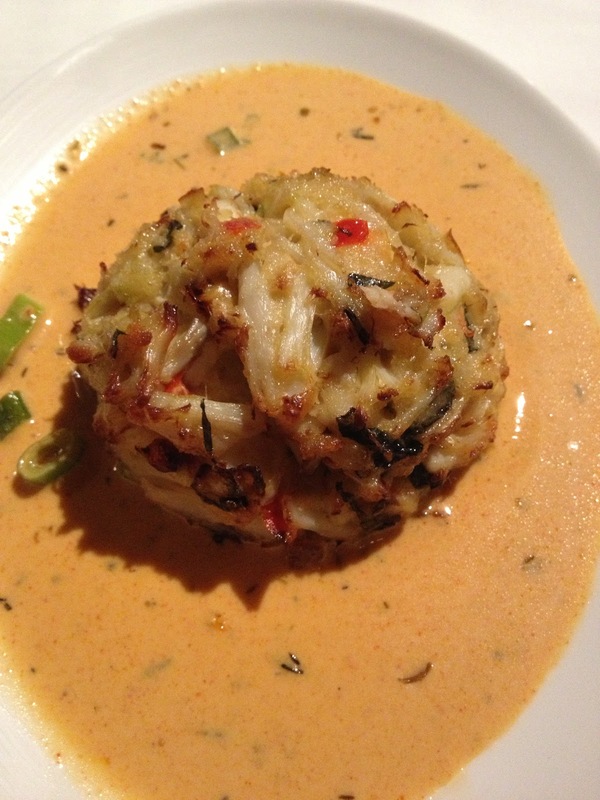 I'd call the Crab Cakes a "must order" and I'll look forward to exploring more of their menu in the future. The service was flawless and a real high point here. Our waiter's enthusiastic, attentive, polished yet down to earth style was just what I look for in a restaurant like this. Supporting staff was also excellent with several different individuals tending to us over the course of the evening but never in a confusing or disruptive way. We never wanted for anything and our table was magnificently tended to the entire evening. Some of the most impressive build out in a restaurant I've seen in Boston.The restaurant is absolutely gorgeous with a very rich feel to it. 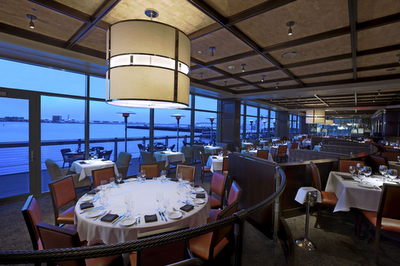 Sweeping views of the harbor remind you you're in Boston. There's a certain "New Year's Eve" bling to it that denotes it's a special occasion kind of place, but at the same time I felt comfortable wearing a half-zip sweater and dark denim. Very comfortable seating and spacing between tables. We felt like we were part of the action yet could have our own conversation. One peculiarity: The dress code for female servers seemed to be tight fitting black with very short skirts. Gave it a touch of a Vegas cocktail vibe for better or worse. Total bill came to $193 for the two of us, and we enjoyed ourselves tremendously. Del Frisco's Double Eagle Steakhouse should be included in discussions about the best steakhouses in Boston.